Bodger's Travelling Variety Circus is a sad collection of second-rate variety acts. When a tragic fatal accident occurs under the Big Top, world-famous escapologist Slippery Sid meets an untimely end! 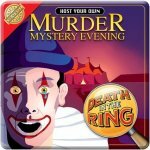 Over the course of a dinner party you must unravel the mystery and solve this intriguing whodunnit! You and your guests will each play the part of one of the suspects, sharing information and hiding guilty secrets as you decide who dun the dastardly deed! 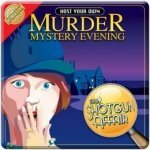 This thrilling Murder Mystery Evening is a battle of wits and cunning in which you'll vie to out-sleuth each other as you seek to solve the case, and reveal the monstrous murderer in your midst. The Time: The present day The Place: Shippe Mansion and the reading of the late Lord's will. The Murder: Lord Shippe is blasted to death with his own gun! A tragic shooting accident... or was it? The Scene: Over the course of a dinner party you must unravel the mystery and solve this intriguing whodunnit! You and your guests will each play the part of one of the suspects, sharing information and hiding guilty secrets as you decide who dun the dastardly deed! This thrilling Murder Mystery Evening is a battle of wits and cunning in which you'll vie to out-sleuth each other as you seek to solve the case and reveal the monstrous murderer in your midst!